Attached character gains Fast and +1 skill for each Tome card in play. 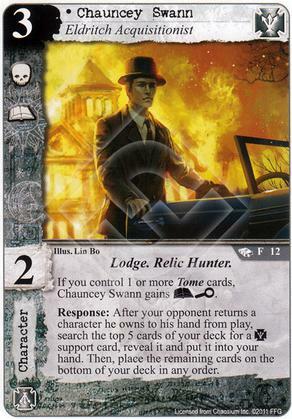 If you control 1 or more Tome cards, Chauncey Swann gains (A)(I). 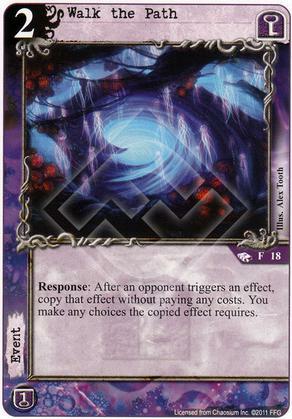 Response: After your opponent returns a character he owns to his hand from play, search the top 5 cards of your deck for a [Silver Twilight] support card, reveal it and put it into your hand. Then, place the remaining cards on the bottom of your deck in any order. 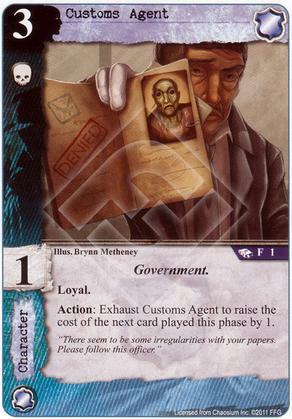 Action: Exhaust Customs Agent to raise the cost of the next card played this phase by 1. "There seem to be some irregularities with your papers. Please follow this officer." 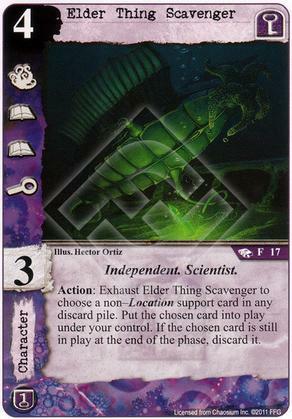 Action: Exhaust Elder Thing Scavenger to choose a non-Location support card in any discard pile. Put the chosen card into play under your control. If the chosen card is still in play at the end of the phase, discard it. X is the number of insane characters in play. 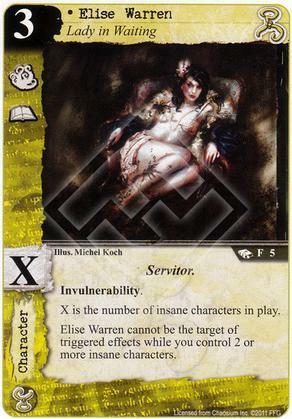 Elise Warren cannot be the target of triggered effects while you control 2 or more insane characters. 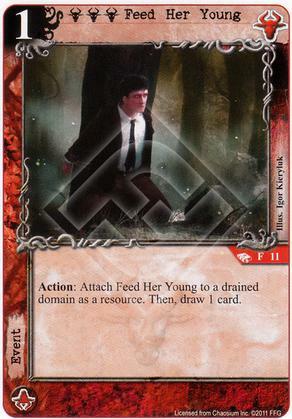 Action: Attach Feed Her Young to a drained domain as a resource. Then, draw 1 card. Play during your opponent's turn. Response: After your opponent has committed characters, choose a story. Uncommit each character at all other stories. Then commit them to the chosen story. 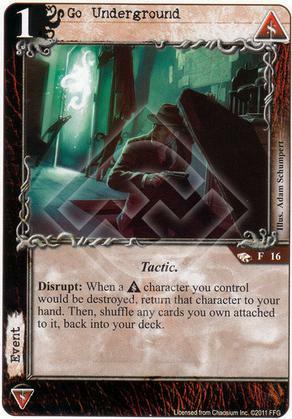 Disrupt: When a [Syndicate] character you control would be destroyed, return that character to your hand. Then, shuffle any cards you own attached to it, back into your deck. 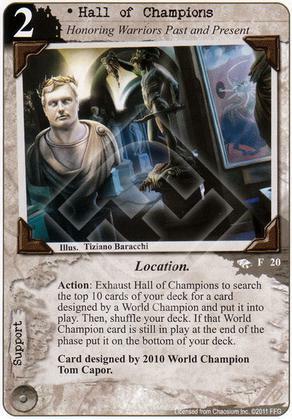 Action: Exhaust Hall of Champions to search the top 10 cards of your deck for a card designed by a World Champion and put it into play. Then, shuffle your deck. If that World Champion card is still in play at the end of the phase put it on the bottom of your deck. Card designed by 2010 World Champion Tom Capor. Jon Pechon was methodical, detail oriented, a self-starter, and capable of developing and following complex strategies to achieve his goals. And working for O'Bannion, he even managed to turn his psychopathy to an advantage. 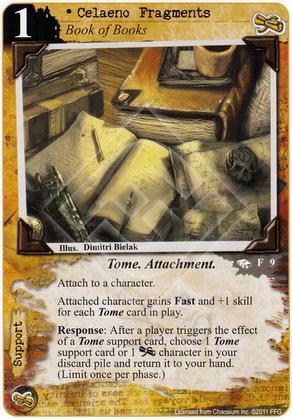 You may play Tome cards from your discard pile as if they were in your hand. 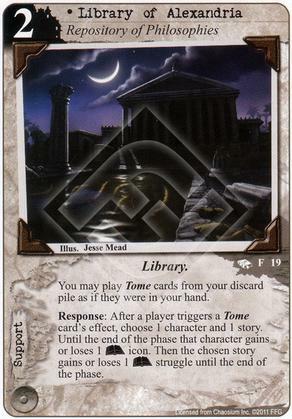 Response: After a player triggers a Tome card's effect, choose 1 character and 1 story. Until the end of the phase that character gains or loses 1 (A) icon. Then the chosen story gains of loses 1 (A) struggle until the end of the phase. 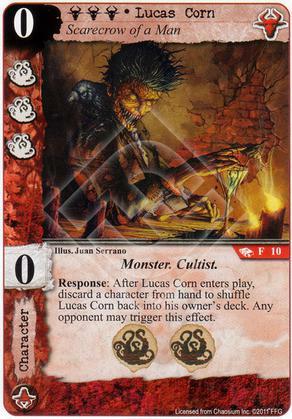 Response: After Lucas Corn enters play, discard a character from hand to shuffle Lucas Corn back into his owner's deck. Any opponent may trigger this effect. 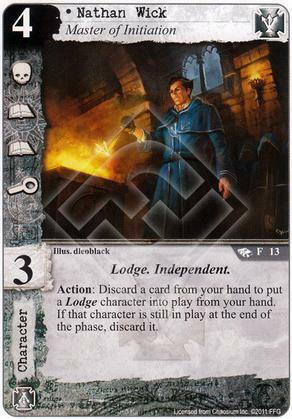 Action: Discard a card from your hand to put a Lodge character into play from your hand. If that character is still in play at the end of the phase, discard it. 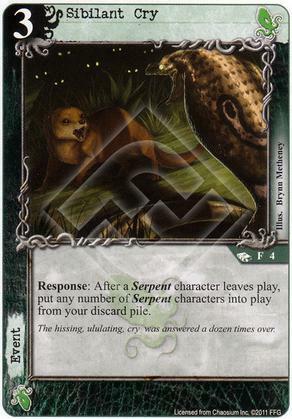 Response: After a Serpent character leaves play, put any number of Serpent characters into play from your discard pile. The hissing, ululating, cry was answered a dozen times over. 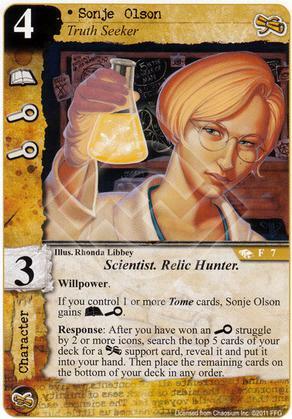 If you control 1 or more Tome cards, Sonje Olson gains (A)(I). 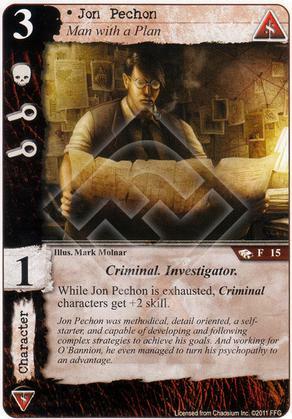 Response: After you have won an (I) struggle by 2 or more icons, search the top 5 cards of your deck for a [Miskatonic University] support card, reveal it and put it into your hand. Then place the remaining cards on the bottom of your deck in any order. 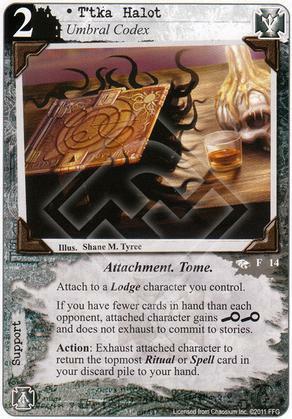 Attach to a Lodge character you control. 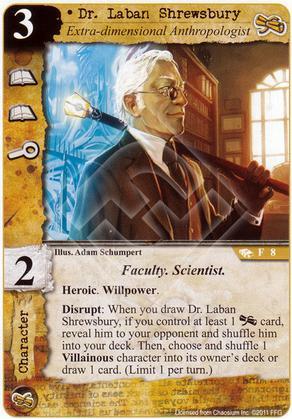 If you have fewer cards in hand than each opponent, attached character gains (I)(I) and does not exhaust to commit to stories. 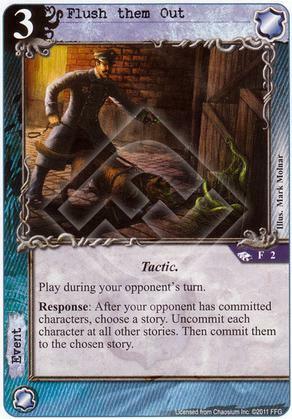 Action: Exhaust attached character to return the topmost Ritual or Spell card in your discard pile to your hand. 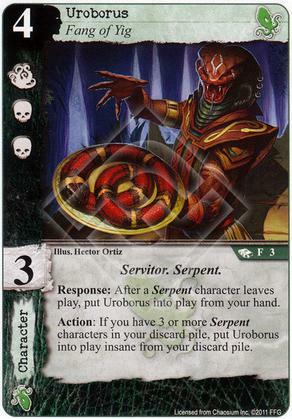 Response: After a Serpent character leaves play, put Uroborus into play from your hand. Action: If you have 3 or more Serpent characters in your discard pile, put Uroborus into play insane from your discard pile. Response: After an opponent triggers an effect, copy that effect without paying any costs. You make any choices the copied effect requires. Action: Restore all insane characters you control. 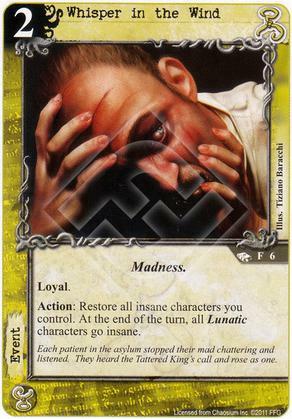 At the end of the turn, all Lunatic characters go insane. Each patient in the asylum stopped their mad chattering and listened. They heard the Tattered King's call and rose as one.